What is another word for reckless? 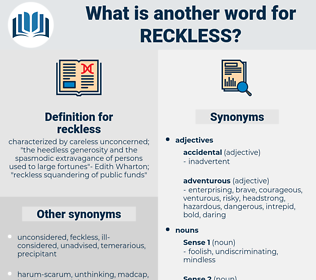 characterized by careless unconcerned; " the heedless generosity and the spasmodic extravagance of persons used to large fortunes"- Edith Wharton; " reckless squandering of public funds"
careless, irresponsible, foolhardy, thoughtless, rash, senseless, inconsiderate, ill-judged. 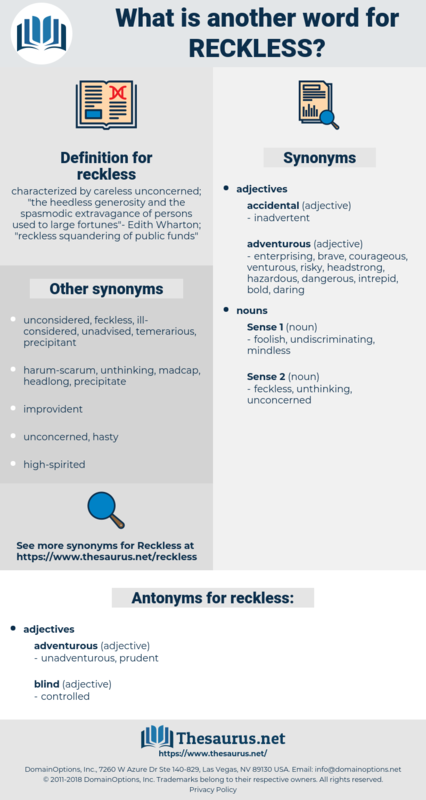 merciless, fearless, frivolous, foolish, short-sighted, risky, fancy-free, stray, hasty, dangerous, feckless, blind, daring, crazy, suicidal, unreasonable, bold, desperate, hazardous, inappropriate, indefensible, savage, cool, prudent, insane, neglectful, unsafe, remiss, casual. imprudent, ill-considered, ruthless, negligent, unwise, indiscriminate, ill-advised, carefree, unscrupulous, mindless, injudicious, misguided, wanton, unconscious, unaccountable, unthinking, inadvisable, deliberate. meek, retiring, reticent, timid, shy, frightened, humble. concerned, painstaking, mindful, thoughtful, ready, accurate, attentive. Submitting, acquiescent, obedient, subordinating, submissive, respectful. easy, easy-going, calm, unexcitable, laid-back, uninspired, passive, insensitive. mousy, craven, responsible, intelligent, timorous, yellow, fainthearted, chickenhearted, skittish, spineless, overcautious, cool, sharp, scary, pusillanimous, recreant, unambitious, lily-livered, overcareful, levelheaded, sensible, guarded, quick-witted, unheroic, dastardly.
" That was rather a reckless bit of driving," he admitted. I confess that I love most the reckless, loving type; and I believe that you and I are unlike Helen there - we kiss, we don't hold out the cheek. rocklike, reglaecus, rugelach, roccellaceae, russulaceae, riskless, rose leek, rushlike, regulus, roughleg, rose-like, recluse, roselike, ruggelach, recoilless, rosales, rose-lilac.